As a critical consumer of media, it is not often that I’m so engaged in a TV advertisement that I feel compelled to turn to my roommate and say, “That was a great commercial,” but this past week, that is exactly what happened when my nightly viewing of the Food Network was interrupted by a pivotal Subaru commercial. A smashed car, a tow truck, and a junkyard—these are not the traditional things you think of when imagining car commercials, but that is exactly what you see within the first 15 seconds of the ad. Subaru certainly managed to break through the clutter of typical car commercials, which usually depict sleek, fast cars, zooming through scenic back roads or show happy families piling into a minivan. With limited dialogue and a demolished car, this ad catches your attention by being much different from the rest. Rather than focusing on innovative style or powerful engines, the company promotes Subaru’s life-saving qualities. For more than half of the Subaru ad, these are the only two words spoken between the characters on screen while the audience follows a car from the scene of what appears to be a fatal car accident all the way to the junkyard. The audience is constantly reminded that despite the appearance of this destroyed vehicle, the passengers miraculously managed to survive. 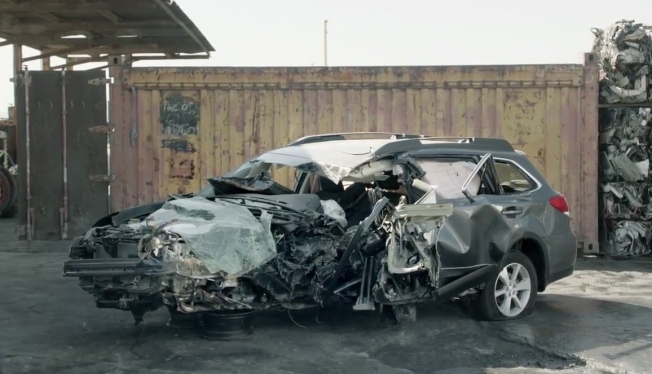 By the end of the commercial, viewers realize that the passengers inside were a family who, thankfully, attributed their lives to the safety of their Subaru. According to Subaru spokesman Michael McHale, the commercial was inspired from real-life accounts Subaru has heard from customers reporting that their Subaru saved their lives and the lives of their loved ones in nearly fatal car accidents. Additionally, the maimed vehicle depicted throughout the ad is not a stage prop; it is an actual wrecked car where the driver survived. When it comes right down to it, would you rather have a car that travels at breakneck speed or a car that will ultimately save your life? This ad simply projects the messages that safety trumps luxury, and the livelihood of consumers is paramount when promoting products. What do you think of Subaru’s new ad? Share your thoughts with us! Don’t forget to “like” us on Facebook and follow us on Twitter and Pinterest. Watch the commercial again….is that boy running to the car without a full arm? Momsong: What do you think of Old Spice’s new ad?